Litton Monroe Epic 3000 keyboard/printing unit and calculating unit. Electronic calculator made by Monroe in USA, introduced in 1967, serial number B996581. Distinctive features: Consists of two units: a keyboard/printing unit and a calculating unit. Performs the standard 4 functions & square root, and is "programmable" in a rudimentary manner. Capabilities: 4-function, square root, printing calculator. When switched to "learn" mode it remembers up to 42 steps of calculation, so that thereafter all control key selections are automatic. However, branching is not available. Size: Keyboard/printing unit - 315 x 435 x 225 mm (12.5" x 17" x 9"). Calculating unit - 510 x 120 x 550 mm (20" x 5" x 22"). Weight: Keyboard/printing unit - 14 Kg (30 lbs). Calculating unit - 14 Kg (30 lbs). Technology: Uses individual transistors (mainly RCA 581005B & 581024B transistors) on four boards 355 mm x 350 mm (14" x 14"), one of which has 2 delay-line memories. Made in USA, introduced 1967. Significance: Monroe produced high quality, high capability mechanical and electro-mechanical calculators. By this time they were owned by Litton Industries. Calculators like this were soon out-moded by the use of Large-Scale Integrated-Circuits (LSI). 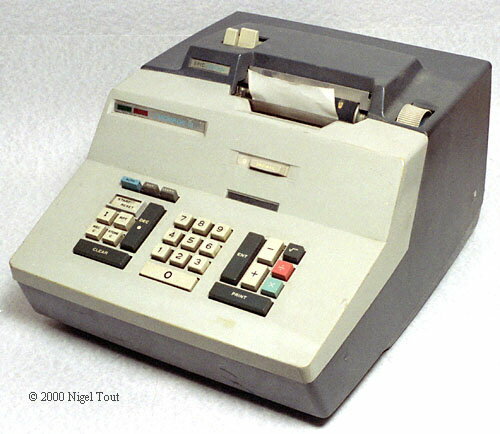 Was advertised as the "First Programmable Printing Calculator", though there were actually more advanced previous programmable calculators, such as the Wang models and the Olivetti Programma 101. "Performs an average division operation in 1/4 of a second; multiplications take 1/3 of a second; 16-digit or single-digit figures are handled at the same speed. Addition and subtraction take 1/125 of a second; square roots take 1/2 second." Advertisement for the Monroe Epic 3000 from 1967. 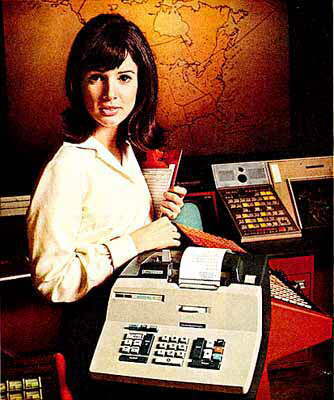 "Photographed at NORAD, Colarado Springs"
"Beautifully efficient: The new Epic 3000 Electronic Printing Calculator"
"The only electronic calculator that is operator programmable. Simply push a learn button, do a problem once, and the Epic is programmed to automatically repeat similar arithmetic functions on other problems. Insures accuracy and saves time. Finds square roots in just a half second. Line by line results are printed on tapes that provide a permanent record and can be checked at any time." Note that no mention is made of the large electronics unit. The keyboard/printing unit with cover removed. The calculating unit with cover removed and 2 of the 4 boards hinged down for servicing. One of the circuit boards with a delay-line memory which has been opened up, showing the 2 memories. Close-up of one of the delay-line memories. One of the circuit boards. Size 355 x 345 mm (14 x 13.6 ins). Transistors - RCA 581005B & 581024B. The circuit boards have copper conductors on one side only. The red wires are enamelled copper wire which provide additional connections. "What's new at the BEE [Business Efficiency Exhibition]", Data and Control Systems, Oct. 1966, p61.